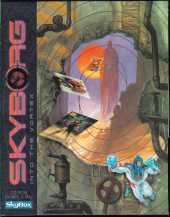 This graphics adventure game from Skybox (the well-known trading card company), came with three packs (18 cards total) of Skyborg trading cards. In the game, you are the Skyborg. The objective is to find and rescue Dr. Barton from his kidnapper(s) and escape. Along the way you will visit nine varied worlds, each of which has things needed to complete the game. While wandering around, you will encounter 95 characters in the form of cards, some of which are on walls or posters; many of the character cards are just standing around for you to walk up and acquire tools, knowledge, and weapons from them, a very unrealistic and unbelievable concept. There are several times in the game when you have to battle a "sentinel" (robot) in an action sequence (it's easy to die here). Overall, the graphics in Skyborg are not particularly outstanding, although some of the animations are actually quite good (the equipment repair/morphing sequence is pretty cool). Most of the graphics are static pictures with scattered hot-spots. There is quite a bit of text to read, which comes across as notes found or electronic messages received by Skyborg; these latter messages are printed on the screen in tiny letters and are difficult to read without getting close to the monitor. The audio has its moments, although the voice of Skyborg's nemesis, the evil Morb, comes across as very amateurish and grating; the original soundtrack and music is provided by the band Primal Future.